Watch Rainbow, a young moon bear who nearly died in a trap, returned to the wild after treatment. When Rainbow was discovered in the mountains of Peng Zhou, China in August, her rescuers were shocked by what they saw. 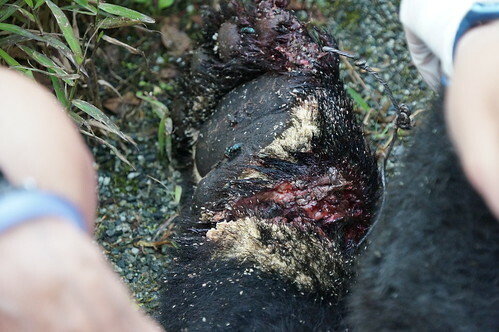 Maggots were crawling in her infected wounds (pictured below), her teeth were damaged from attempting to chew through the wire snare and she’d even tried to chew through her own paw in desperation. But now - four weeks later - Rainbow has returned to her mountain home, thanks to Animals Asia’s veterinary team and the help of experts in both China and the USA. Sadly, Rainbow’s damaged paw could not be saved, but her wounds are healing and bear biologists Liu Fang in China and John Beecham and Dave Garshelis in the US were in agreement that Rainbow was a good candidate for release and would have every chance of surviving in the mountains of Peng Zhou. This is the first time Animals Asia has released a rescued bear — thanks to a number of circumstances. In most cases when young bears are rescued by Animals Asia, it is not possible to find out exactly where they have been taken from. Illegally captured bears are often moved long distances from their origin, are nutritionally deficient, and ultimately have become conditioned to humans as a source of food. However, in this case it was possible to collaborate with enthusiastic Peng Zhou Forestry officials who know the region well, and return Rainbow to the area where she was born and had spent the first year of her life. The forestry officials believe the snare which caught Rainbow, who is thought to be a yearling, is a relic from before the area became a protected reserve. Forestry staff have since swept the area for traps and are active in prosecuting poachers operating in the mountains. Prior to her release, Rainbow was fitted with a GPS collar to help monitor her progress, but concerns over the suitability of the device, prompted the decision to release her without a collar. The setback was the second unexpected event during Rainbow’s release. Prior to release, one of her canine teeth were found to be cracked. With any delay likely to hinder her chances of returning permanently to the wild, the decision was taken to immediately remove the tooth under anaesthetic. Rainbow’s release was made possible thanks to the input of bear biologists Dave Garshelis, Liu Fang and John Beecham. IUCN Bear Specialist Co-Chair, Dave Garshelis has over 30 years experience as a bear biologist conducting research in north America and Asia. John Beecham is the IUCN Human - Bear Conflicts Team Chair and also has over 30 years experience in the field. He consults on release programmes all over the world. Respected Chinese Bear Biologist Liu Fang has worked domestically and internationally on bear research and specifically on population studies with Asiatic black bears in China. Animals Asia continues to care for nearly 600 bears in sanctuaries in China and Vietnam. Please consider sponsoring a bear today.